Enter your information and our staff will contact you shortly. 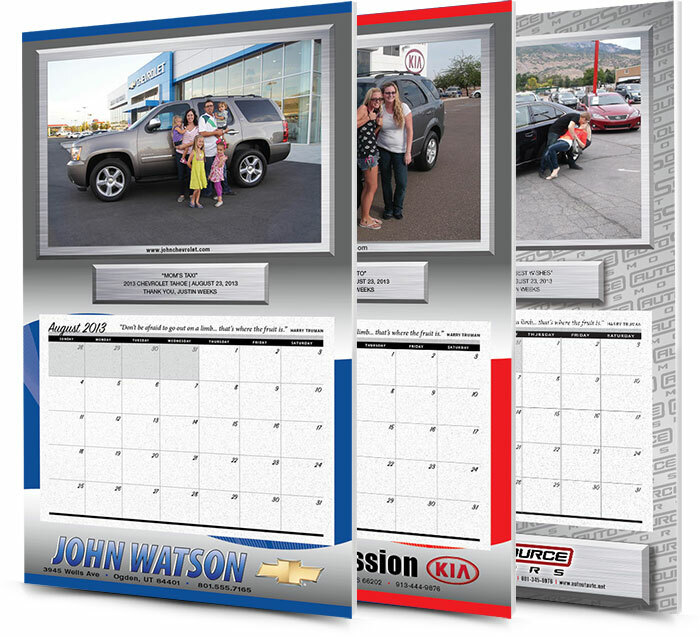 As you struggle to stay in front of your customers… a personalized photo calendar in your customer's home or office will keep you in front of them at least 5x a day and sell you (the dealership) to their friends and family. Our 2 year calendar pad contains service coupons, CSI reminders, and referral requests. 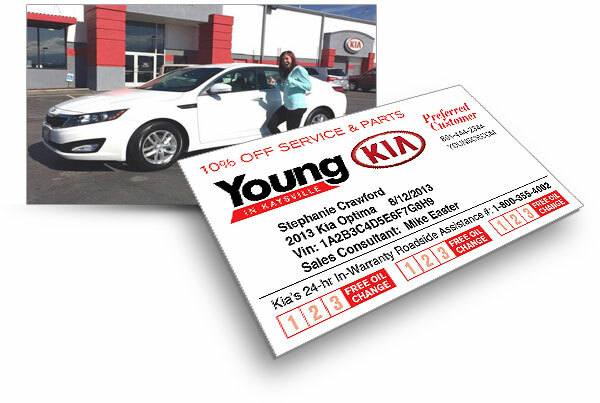 The final coupon invites the customer to the dealership for a calendar pad refill. This gives you the opportunity to sell them a new vehicle, or say hi and stay in front of them for another 2 years. Increase sales, CSI, retention, and net profit. According to recent data, the average car buyer is shopping 6 dealerships online before they physically visit a dealership. Of the 6 websites they shop, the average customer is only visiting 1.2 dealerships in person. With the CSI app, you can effectively get 5-star reviews at the point of delivery with our partner, Podium! 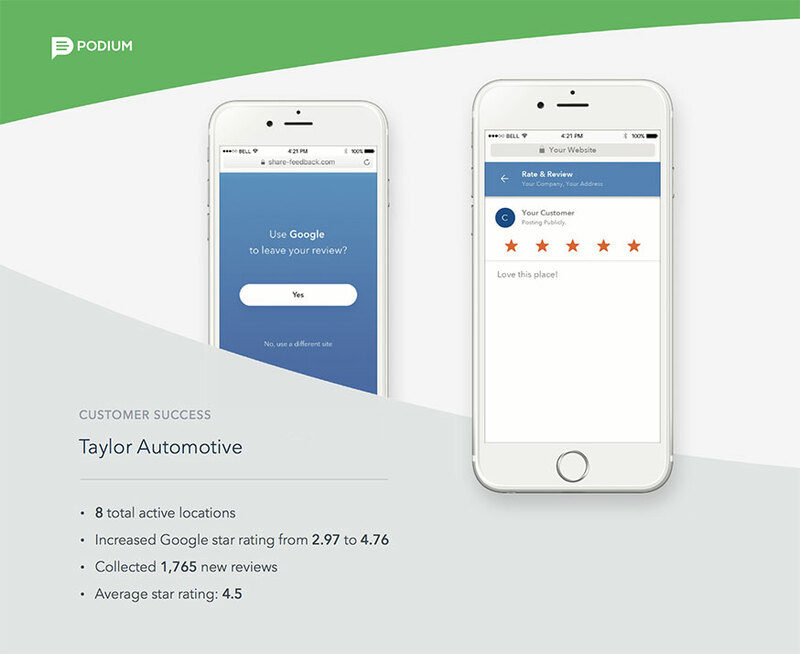 Podium is an online review platform that finally removes all the barriers and friction for your happy customers to leave positive reviews for your dealership. This will increase your SEO, guaranteeing your dealership is one of the 6 websites customers shop online. 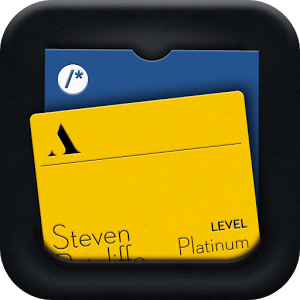 Most people throw away or lose a business card… with their photo on the reverse side of a Preferred Customer card; they won't lose or throw you away. Instead they will brag about being one of your "Preferred Customers" and love being treated like royalty in your service department. 78% of customers would buy where they have their vehicle serviced. Increase retention, absorption, sales, and net profit. Let your customers create referral business immediately! 30% of your customers have a family member who'll be buying or trading a vehicle within the next 90 days. 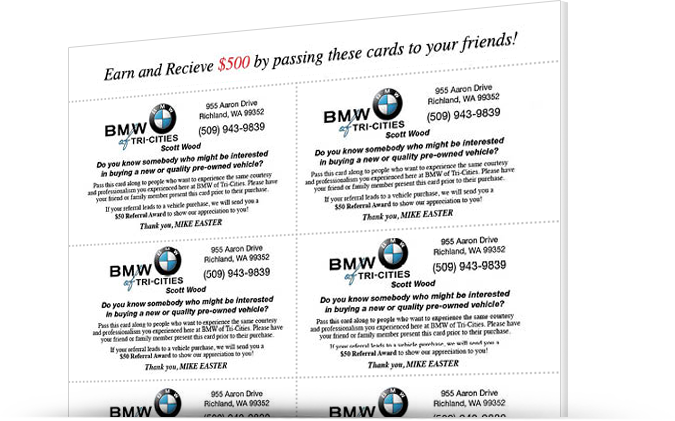 With a sheet of 10 referral cards, you motivate your customers to refer their friends and family immediately. 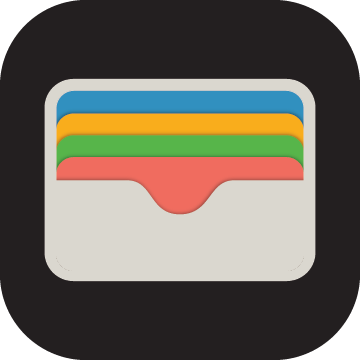 The cards allow you to track the customer who is sending the referrals. Increase sales, gross, and closing ratios. Connect with your customers & their mobile device. 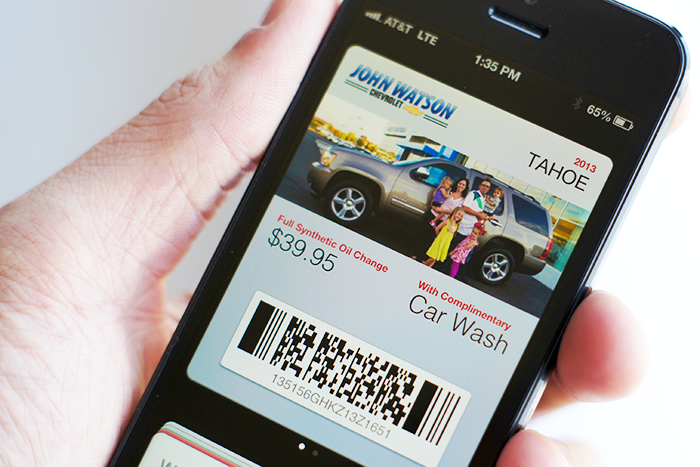 Wallet allows you to give your customer a digital "Preferred Customer" card with all of the dealership's info, the customer's vehicle info, and their photo. It allows them to schedule service appointments from their device. With the click of one button, you can update your customer's Wallet with your current parts, service, and accessory specials. Increase your retention, absorption, and net profit. 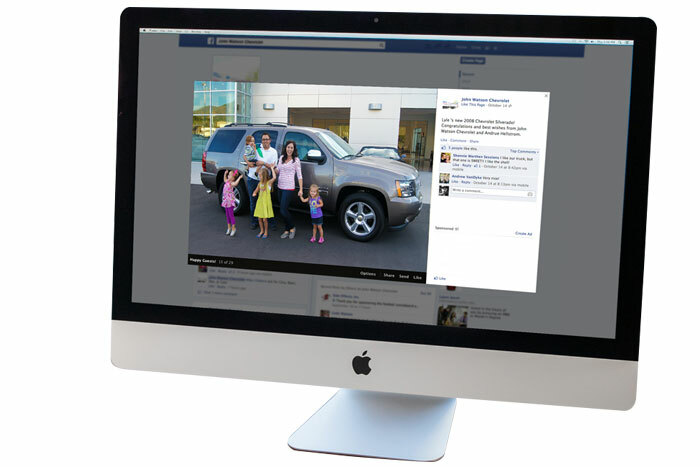 A picture is worth a thousand words… as your customers photos are posted to your dealership Facebook page through Calendar Systems, you create a web based "Evidence Manual" and increase your overall reach to prospective customers. If you sell 100 vehicles a month and every customer had 100 Facebook friends to share their photo with. Your customers would be contacting/referring you to 120,000 more people each year. Increase traffic, sales, closing ratios, and gross. Do your sales people know their customers? 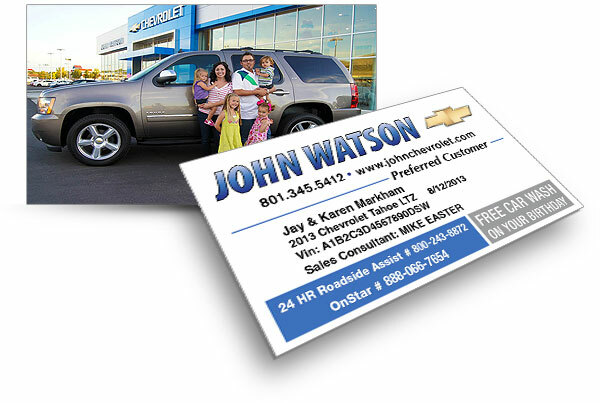 With our Client Information card, your sales people will have a photo to go with their customer's name. This will help them remember their customers. 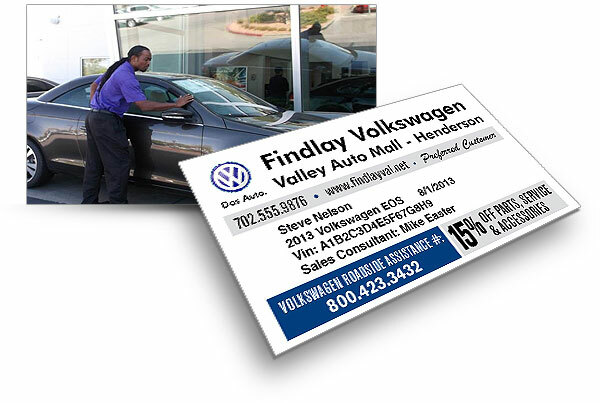 Making follow up more effective and making customers feel at home when they are called by name at your dealership. (i.e. Do you remember text or pictures?). Increase retention, sales, and net profit. Does your customer feel your appreciation? 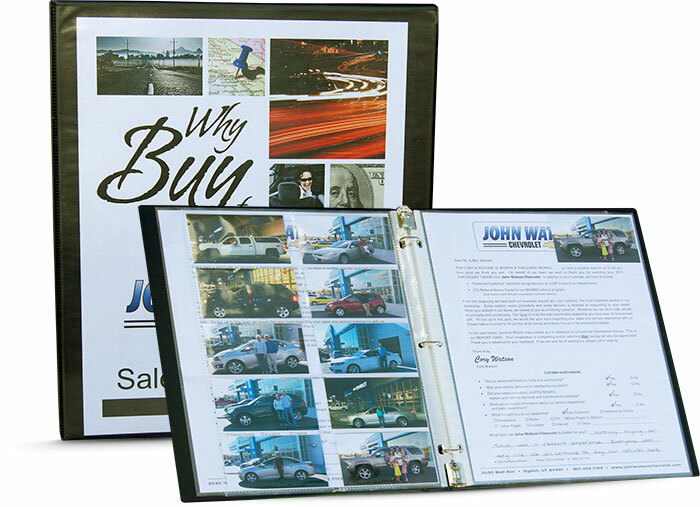 A letter specifically designed by your dealership is placed with each calendar. It can be a simple "Thank you" or a brief questionnaire. Whatever the case, the customer feels your appreciation when they receive their calendar package and thank you letter. 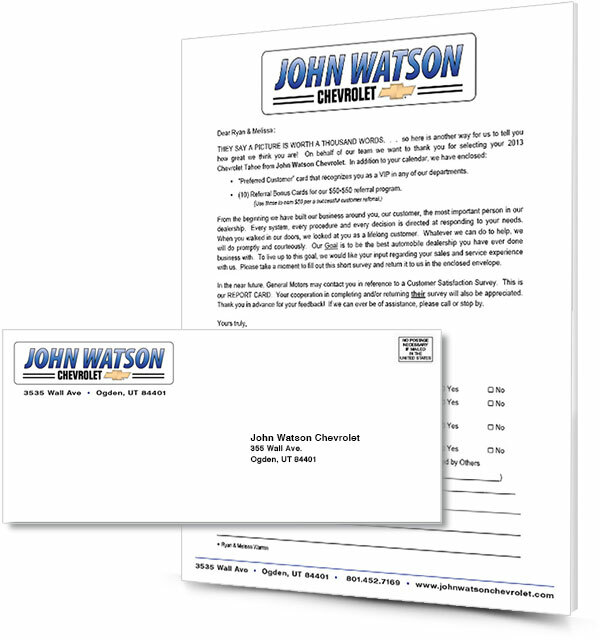 Note: If the letter requests a response from the customer, a pre-stamped, self-addressed return envelope is included. What are your customers doing and thinking about when their sales person is at the tower working the numbers… an Evidence Manual will confirm to the prospective buyer that there is no need to shop the competition, increase credibility, and close deals. 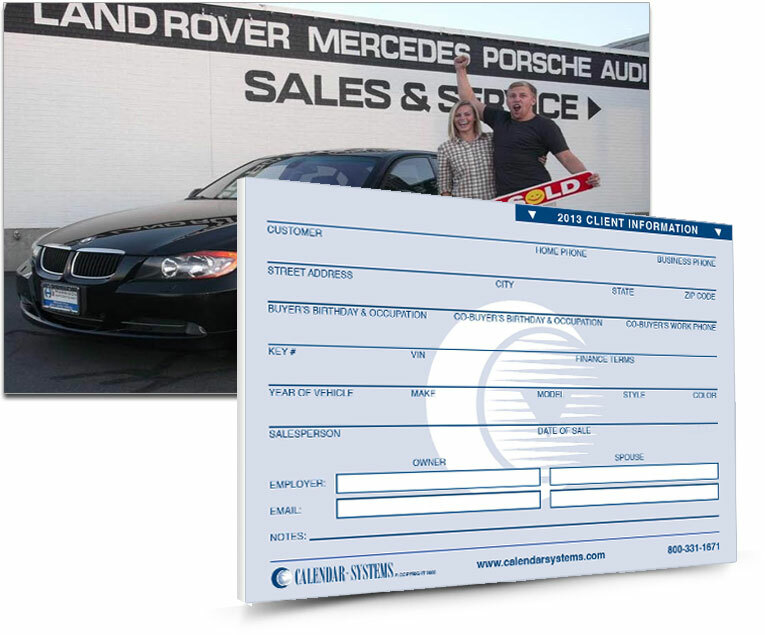 Calendar Systems provides a wallet size photo for the sales people to put in their Evidence Manual. Increase closing ratios, gross, and sales. Do you impress your customer a year after the sale? Most customers feel forgotten and probably have been forgotten a year after their purchase. 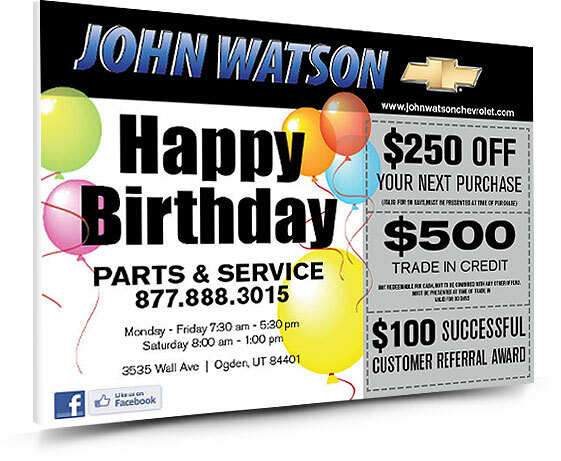 With our "Happy Birthday" card that celebrates the first year of ownership, the customer is surprised and feels a part of your dealership family. The coupons are optional. We also offer Holiday Cards, customer birthday cards, etc. © 2013 Calendar Systems, all rights reserved.